Disney Parks has pulled the curtain off of Star Wars: Galaxy's Edge. A preview of the absolutely massive 14-acre new addition to the park was given last week and there is a lot going on within the immersive experience. The rides are not yet operational, but it sounds like they will be some of the longest experiences that Disneyland and Disney World have ever offered. Additionally, the parks went out of their way to even make the waiting a fun and immersive experience. Millennium Falcon: Smugglers Run offers Star Wars fans a chance to pilot the biggest hunk of junk in the galaxy. While waiting to board the cockpit, park goers are going to be able to walk around the ship and take pictures, which is obviously a dream come true for many people from all over the world. The ride is set in the latest trilogy timeline, so Han Solo, unfortunately, is not around anymore. But, Chewie can be spotted and some of those Porgs from The Last Jedi are also around. 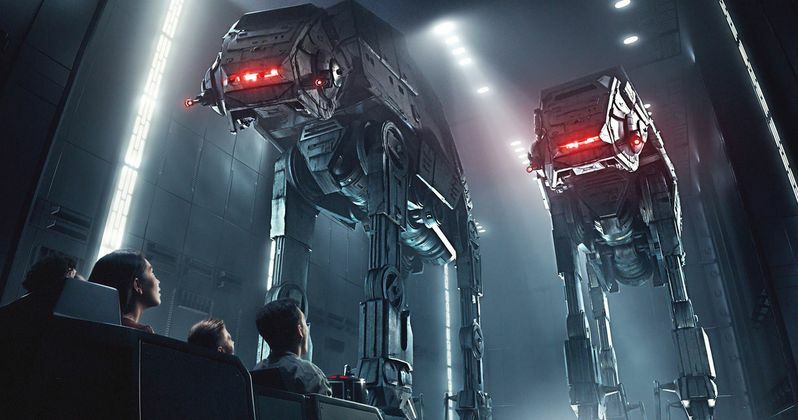 On the opposite side, the Rise of the Resistance ride will give visitors a chance to be caught in the middle of a battle between the Resistance and the First Order. It has just been revealed that visitors will be joined by Daisy Ridley, John Boyega, Oscar Isaac, and Adam Driver, who have shot new footage exclusively for the ride that will give Rey, Finn, Poe Dameron, and Kylo Ren a presence in the attraction. This is not just a normal set of attractions for Disneyland and Disney World, this is a new park with its own identity. To give off a more immersive experience Star Wars: Galaxy's Edge has merchandise that feels like it would have come from the movie. Nothing is in packaging and the plush toys are rather crude looking. Park visitors will be able to head over to Savi's Workshop, deep within the Black Spire Outpost, to make their own custom Light Sabers, complete with its own kyber crystal. Star Wars fans are even going to be able to purchase and drink the infamous blue milk while at the park and some people can even get weirder and go with the green milk from The Last Jedi. Star Wars: Galaxy's Edge opens this summer at the Disneyland park in Anaheim, California and later this Fall in the Orlando theme park. There is literally too much stuff going on within this new expansion that will automatically turn the Play Disney Parks App into another way to truly get the most out of your Star Wars experience. The parks have not yet revealed how they are going to deal with the huge wait times when the park opens, but that information should be revealed soon. One thing is for sure, this is an experience that Star Wars fans have dreamt of and it's almost time to go visit. This information was first reported by Star Wars.